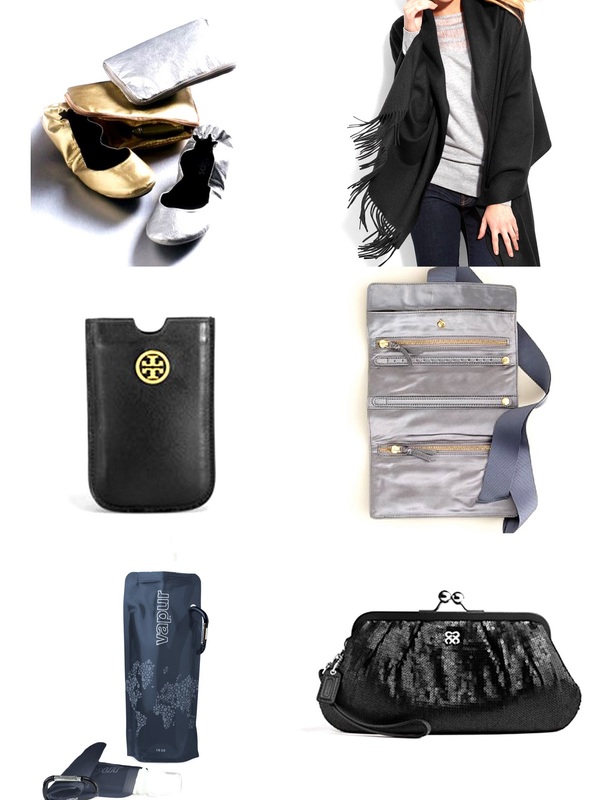 With the Thanksgiving travel this past week, my recent business trips, and more upcoming holiday travel, I have been packing and re packing my travel handbag. The good thing is I am getting closer to mastering all the items I need to bring in my large travel tote. Now if I can just master packing for business trips and vacations I will be all set. These flats are perfect for the airport security line and for those times when you have been wearing high heels for too many hours. They fit perfectly in most handbags and they come in a pouch that converts to a full size tote bag. They are also available in this luxe leopard print at Neiman Marcus. This medium weight single ply cashmere wrap functions as a cozy wrap on the airplane and converts to a stylish scarf during the day or a wrap on a cool evening. I have several non-cashmere shawls but my favorite one to use is a beige soft cashmere wrap I received as a gift. I think I might need a black one next. It really does make a difference when it is cashmere! I just saw this and I LOVE it. This media sleeve is the perfect way to protect your IPhone when you travel. It comes in purple and orange as well. The black one is not available yet but I am thinking about pre-ordering this one or getting the orange one. I always carry my jewelry in my handbag when I travel and even though I have several jewelry pouch's I love this one from J.Crew. It is made of a soft silk blend, comes in windsor grey or heirloom pink, and it would make the perfect holiday gift for a stylish traveler. These water bottles are convenient, reusable, and they are great for on-the-go use. They are flexible so they stand when they are full and the fold up when they are empty. This is the perfect alternative to carrying a plastic water bottle when traveling. This past week during Thanksgiving I stopped into the Coach store and I saw these wristlets and the poppy occasion sequin pouch's and I love them. The benefit of carrying a clutch in your travel handbag is you can keep all your small items organized. I like to fill my clutch or wristlet with gum, chapstick, hand sanitizer, lip gloss, and other small items. Then when you arrive at your travel destination you can use the wristlet or clutch as an evening bag. What are some of your "must have"accessories for traveling in style?